Has anyone ever tried Black Goat? That is until you realized it does not taste or looked like lamb meat. It's a pretty weird concept and worth a Deep End Dining style trip to further enhance your foodie adventures. It's a weird concept only because this was an actual protein that is very popular in Korean cuisine, but only a few places in Los Angeles would served it. Seriously, I would need to dig deeper to find other hole in the wall places to get this kind of discovery. 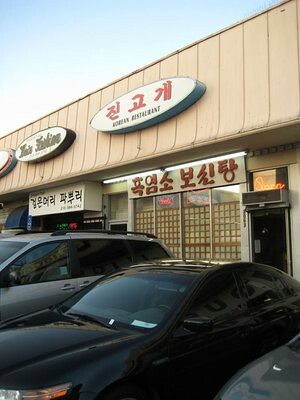 I have heard this place was very popular in Koreatown for over two decades. 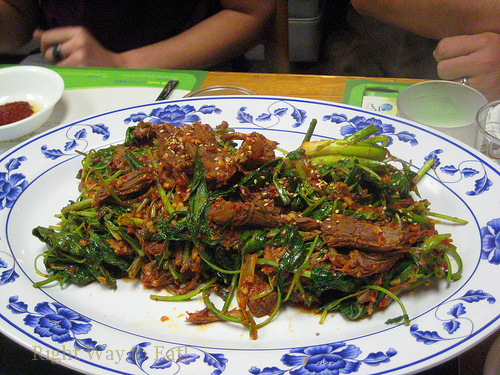 Many Korean Angelanos have regard The Black (heukk) Goat (yeum so) is served two ways here. 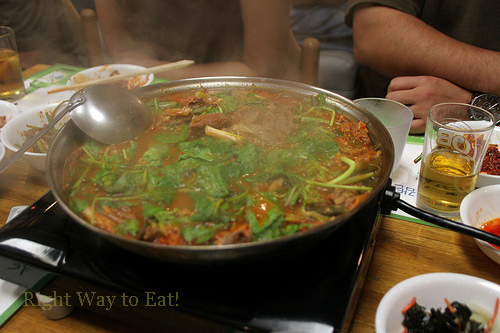 The most popular ordering choice is served in hot spicy soup (tang) and can be ordered in sauteed fried style as well. Both popular dishes will set diners back to around $15 each and will feed about 4-6 people for each order. We get the usual bahn chan starters before the main courses arrives. Usually the Korean appetizers are there to tie you down just like peanuts in a steakhouse can do for you. The cucumbers and sweet daikons are some of my favorites in these Korean restaurants. It was too bad that the ever popular bean sprouts was not in effect at this place, but it doesn't diminish the arrangements that was placed in front of us before the mains were served. The first dish is a sauteed Goat Salad. 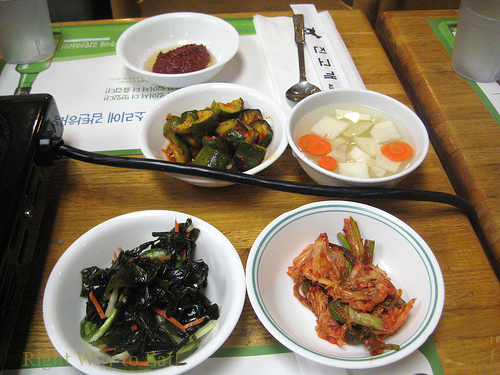 According to my research, the yeum so is served with arrays of different vegetables. The main components of that salad style dish has some Korean sesame leaves (kkaennip) with a dash of chili, garlic, red pepper, and sesame seeds (deulkkae). Now here's the catch with this plate. 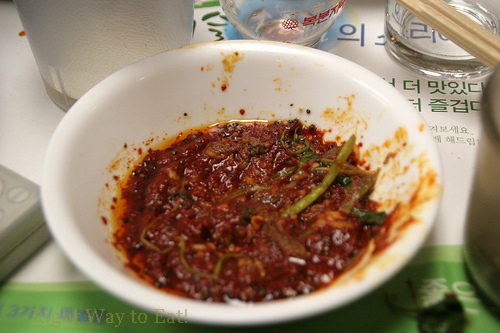 The table provided a glass of deulkkae (the same sesame seeds in the goat salad) where you can mix it with the bowl of chili paste to make your own dipping sauce for the yeum so (goat) meat. The sauce isn't really that secretive nor hard to make. 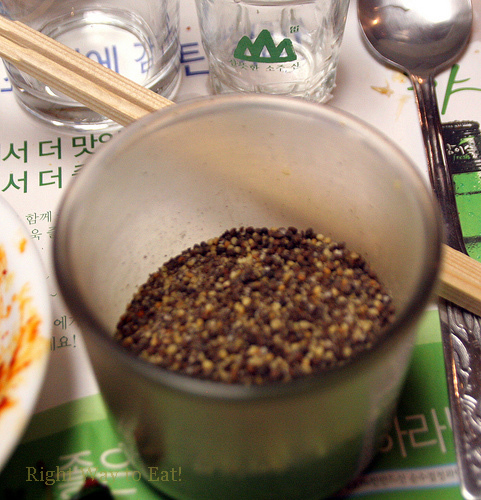 Considering most of the ingredients like the sesame seed can be easily acquired in most Korean shops or markets. There is some sesame oil that is added to enhance the dipping sauce. By dipping the sauteed goat to the sauce add a bold strong flavor taste. Surprising for me was that it was not overwhelmingly spicy nor any drastic sour taste to the meat. If you want a comparison to what it taste like, my best given answer would be like a flank in a Mexican Sriracha sauce. The texture is not as a gamey as I originally had feared, but rather soft and very tender. It was very delicious in an absolute easy dish for it to be made that was also very pleasing to the stomach. The big attraction finally arrives to the table in the form or a big pot with a portable cooker underneath was the goat soup (yeum so tang). 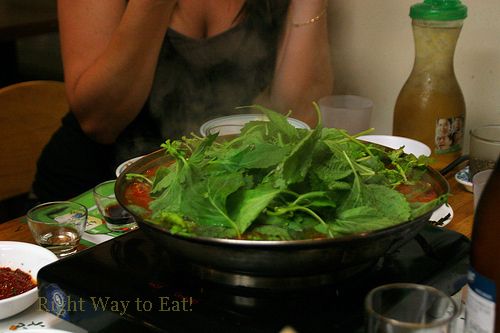 It started off with the servers placing the kkaennip (Korean Perilla leaves) on top of the soup and pushing it down to be simmered while the boiling soup also cooked the goat meat. As we quickly devoured the soup and the black goat meat, couple of observations hit me: one was that the soup just like the goat salad wasn't too spicy. In fact I was expecting the soup to be as hot and spicy like the ones I had in On Dal or Ham Ji Park. My best guess can also be attributed to the fact that maybe someone in our table requested that, but nonetheless the soup is something I want to slurp. The soup was very rich and flavorful while the meat was already in a soup that had the similar components as the sauce was very delicious as well. The other observations was that the leaves and other ingredients in the soup make the broth taste better than most shabu shabu or hot pot places. The soup is probably the highlight in this dish more so than the goat. In this go around, the goat meat was stewed and have this nice texture like a slow braised pork. With the chili paste and other spicy ingredients added on to the goat meat, it was like a melted piece of delicious treat. Is there an adverse after effect like a bad steak? Luckily for me, I was alive and still kicking it the day after. I couldn't say the same for me in an unfortunate dining at Chung King. 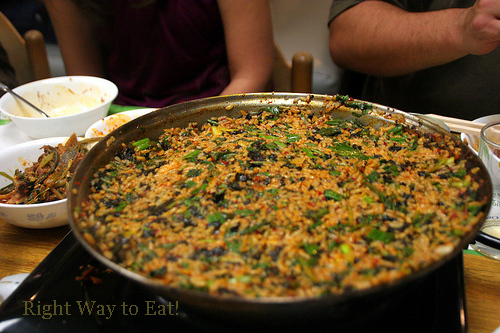 Like some of the traditional Korean places, the meal will end with a round of Kimchee rice. 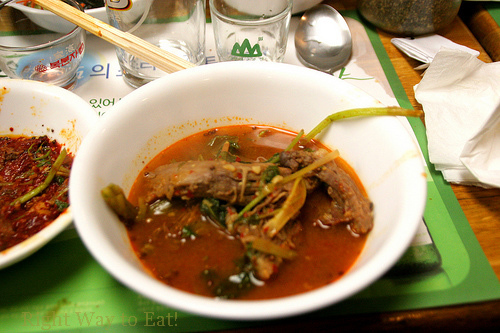 They used the pot from the goat soup to add in rice and a bowl of various kimchee ingredient to make this popular end of the meal treat. I could honestly say I have better (Ondal being one of the place), but it was still very good for what we have that night and still a welcome treat after the meal. My adventure of the black goat dining have me scratching off the list of names of protein I wanted to try. Special thanks to my pal the Minty who invited me along in this unusual Korean specialty dish. This place is a foodie dining institution for many Korean natives who probably doesn't want hoards of invaders coming over to this place as the small place really only have about 8-10 tables. Probably still on the down low as we speak. When I come back here again, the two yeum so dish will be conquered, but I'll make sure this time around they can up the level of the spiciness for the soup. I'm so jealous..I wish this restaurant was in Manhattan; it looks amazing. I'm looking forward to meeting you in San Fran on Friday for the Foodbuzz Festival! and not too spicy is just fine for me. I think you and Mr. Monkey will do fine. This is one of the very few places that welcomed outsiders and they spoke English well enough. It'll be fine. Bummer we didn't meet. Hopefully in another event in the near future. Perhaps! Quit knocking spiciness. You can handle it!! The meat is somewhat the same, but not the ingredients for the soup. You'll love it. Trust me Notorious P.I.G.!! I really like goat meat. Is the menu in English as well? Yes, the menu is in English as well. Luckily, we have servers that was very attentive and understood English better than their neighbor restaurateurs.